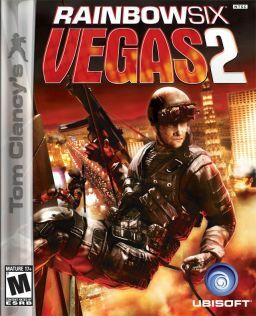 Rainbow Six: Vegas 2 includes a single player campaign/storyline mode as well as a variation of the Terrorist Hunt mode included in previous games, which involves repeated encounters with enemy AI terrorists in a non-linear map. Terrorist Hunt mode may be played "Lone Wolf" (alone) or with a pair of computer controlled allies that may be issued environment-based contextual commands. Both the campaign and Terrorist Hunt game modes support cooperative multiplayer. Present in all game modes is a multi-dimensional advancement system. Rainbow Six: Vegas 2 is the first game in the series to feature a boss battle. The multiplayer in Vegas 2 has been expanded to include more than 10 new close-quarters maps, two new adversarial modes, a newer and different rewards system, and according to Ubisoft, improved online matchmaking. Another feature for multiplayer is that using an Xbox Live Vision camera or a PlayStation Eye, the player could take a picture of his/her face and make him/herself the playable character. A camera can also be used in the PC version as well to create a playable character. Ubisoft released downloadable content for Vegas 2, a Fan pack that includes three maps from the Rainbow Six Vegas and new XP ranks. Previous Rainbow Six games up to Lockdown supported eight human players on the PC in co-op mode, while Vegas reduced co-op to four. Although Terrorist Hunt mode retains the four human player limit (online only), the story mode in Rainbow Six: Vegas 2 has reduced co-op from four players to two players, with the second player assuming the position of Knight, Bishop's teammate. The experience point (XP) system is different from that in Rainbow Six: Vegas in that every kill achieved awards the player XP. XP gains result in promotions which reward the player with new equipment, such as body armor. Players also receive bonuses from the A.C.E.S. combat system, a separate but related advancement system from the XP system. A.C.E.S. advancement is based on the methods used to kill opponents, and weaponry unlocked differs depending on which tactics are used.. Experience can be gained by the player in any game mode, single player or multiplayer, and advancement is shared amongst all modes. Equipment unlocked in one mode is usable in all other modes. The setting for the game initially begins in Pic des Pyr�ne�s, France, in 2005. (This is a fictional location: the only mountain top with an observatory in the Pyrenees is the Pic du Midi de Bigorre). Although the story promptly moves five years forward to Las Vegas, United States of America on July 2, 2010, the same day of Logan Keller's arrival to Las Vegas in Rainbow Six: Vegas. Terrorists have seized control of Las Vegas to instill widespread panic in both the public as well as law enforcement agencies, such as the National Security Agency, North Atlantic Treaty Organization, Rainbow, as well as the local SWAT. As the plot unfolds, however, the setting moves away from Las Vegas to other places, such as a small town in Nevada, unlike in the first Rainbow Six: Vegas, which was mainly in Las Vegas. The events of the game begin shortly before the events of Rainbow Six 3: Raven Shield. Bishop leads his team on a botched hostage rescue operation in which a hostage negotiator is killed due to one of his team members, Gabriel Nowak, defying orders by firing before additional operatives arrive. After securing the hostages, Bishop's team covers Nowak while he defuses a nearby bomb. Nowak is injured during a brief firefight shortly afterward and verbally lashes out at Bishop, taking out his apparent shame and anger on the team. The player pointing to an enemy. The game then moves forward to 2010 in Las Vegas, and Bishop has a new team. The National Security Agency (NSA) suspects two criminals, Miguel and Alvarez Cabreros, of smuggling chemical weapons from Mexico into Las Vegas. Bishop�s team investigates the warehouse containing the weapons but is delayed by a hostage situation that Bishop declares top priority. The NSA informs the team that during the ensuing firefight and rescue operation, a van possibly containing explosives fled the scene. Following the rescue, Bishop learns that in addition to a chemical bomb there is a conventional explosive device. The team locates the escaped chemical weapons van but turns up nothing. They frantically search the area but reach the target, a Las Vegas sports stadium, too late. The chemical weapon is detonated, and many innocent lives are lost. Immediately afterward, Bishop's team learns that the younger Cabrero brother, Miguel, has escaped the area. Bishop's team gives chase, cornering and interrogating him. At first, Miguel denies any knowledge of the bomb, but after the team threatens him he confesses the location of the second bomb. Miguel then draws a weapon on the team and Bishop is forced to kill him. The team learns that the second explosive device is located on a monorail headed towards a populated area. Bishop's team fights their way to the bomb and disables its timer, but they are unable to disable the bomb's remote detonation circuitry in a timely manner. Thinking quickly, Bishop suggests detonating the bomb themselves in an unpopulated area after sending it to a safe distance by activating the train. At this point, Bishop is contacted by the NSA agent, who tells him that the terrorists have set up in a Las Vegas penthouse and are preparing another attack. As Bishop's team nears the penthouse, a sniper injures Sharron, despite assurances by the NSA agent of a safe landing zone; however, they manage to land safely. Echo Team is deployed to take the other building but were killed in a large explosion as Bishop's team pushes forward, revealing the entire assault to be an ambush. After a later battle with the terrorists in a casino, Bishop learns that there is a third bomb held in a Chinese theater. The team assaults the theater and successfully defuses the bomb and saving several hostages. The team escapes and fights their way to the roof and is extracted once the roof was clear. Mike and Jung were then ordered to assist Logan in cleaning up Las Vegas following his team's ambush. On the roof the NSA agent, wearing a balaclava, joins Bishop in the helicopter, saying that Alvarez Cabrero has been spotted at an airstrip in the desert. Bishop and the NSA agent enter the area at separate locations, and Bishop fights his way through an oil refinery and abandoned train-yard in order to get closer to the airstrip. When he arrives, he discovers the NSA agent speaking with Cabrero. The agent is revealed to be Gabriel Nowak, who shoots and kills Alvarez. Nowak then insults Bishop, implying involvement in all of the team's recent troubles, before terrorists appear and attack. Bishop manages to escape. Bishop and his team, defying orders to stand down, follow Gabriel to a Costa Rican villa. As Nowak flees, he taunts Bishop by revealing that he was going to sell information about Rainbow operatives and their families to terrorists. Bishop closes in and attempts to face Gabriel alone; however, an attack helicopter and support troops arrive. Bishop manages to trick the helicopter into radioing for assistance, and Logan manages to shoot it down with the help of a stolen missile battery. Gabriel and Bishop meet finally meet face to face. Gabriel gloats, claiming that he has outsmarted all of Rainbow and arguing that Bishop should have let him fix his own mistakes, including what happened in France (Act I). Nowak eventually attacks, and Bishop is forced to defend himself/ herself, shooting Nowak as the rest of Bishop's team arrive from the other side. Bishop is berated for disobeying orders but is offered a position as deputy director of Rainbow at Hereford, England. Rainbow Six: Vegas 2 is the first game not to adhere to the standard storyline of the Rainbow Six video game series. Notably, in Rainbow Six 3: Raven Shield, which took place in 2005, John Clark held the title of Rainbow Six, though in Rainbow Six: Vegas 2 (flashback in 2005), Ding Chavez carries the title of Rainbow Six. Previous Rainbow Six games also did not have the presence of a drill instructor, as is manifested into Bishop's role in Vegas 2. In previous games, either Ding Chavez or any member of Rainbow could act as a team leader. Gabriel Nowak appears in the first Rainbow Six: Vegas as a member of a team led by Logan Keller, and later as a traitor who is "rescued" by Logan at the fictional Dante's Casino, yet this is less than an hour after Bishop discovered Gabriel's true affiliation in Rainbow Six: Vegas 2 at the fictional Oil Refinery in the deserts of Nevada. Travel time between Las Vegas and the deserts of Nevada in Vegas 2 took well over three hours, yet traveling back for Nowak took less than 60 minutes (although a private jet plane is seen in the hangar where his identity is revealed). In addition, even after Gabriel reveals himself as a traitor to Bishop, his treachery inexplicably remains unknown to the rest of Rainbow as Gabriel is then able to return to Dante's Casino and be rescued by Logan who still thinks him loyal to Rainbow. Although this could be explained as Bishop, the only person to know of Gabriel's betrayal up to that point was unconscious. Rainbow Six: Vegas had no callsigns, though it is important to note that in previous Rainbow Six games, such as Raven Shield, teams were designated as merely "Green", "Red", or "Gold", rather than the traditional "Alpha/Bravo" callsigns used in Vegas 2. In addition, some characters have changed between Vegas and Vegas 2. In Vegas, Logan speaks with a southern accent, but in Vegas 2 he speaks with a more neutral accent. Also, Nowak has pale skin in Vegas, but in Vegas 2, he has a tan.